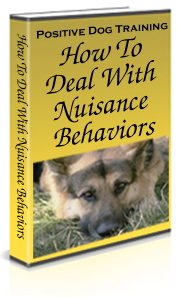 ← Dog Obsessive Behavior – What Can You Do? Should you trust this face? How easy it is to fall victim for those innocent eyes, the cute pose, the soft texture of the Pekingese. You believe you can trust him and you turn your back. 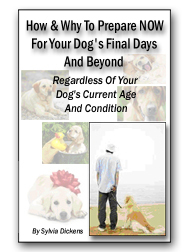 It only takes a second for you to find out the imp has dog training problems. 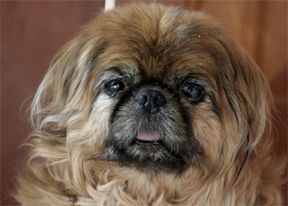 My sister had a Pekingese that was pretty much given the run of the house. She seemed hesitant to train or correct him because he had a rather nasty snarl that he frequently displayed. One day while on an extended camping trip, we were settling in to eat dinner. We were in a tent trailer, which meant the table was level with one of the bunks. Since there’s little floor space for a dog, he spent most of his time on that bunk, watching and drooling as the food was laid out. They finished eating and settled back with their coffee while I finished preparing my spaghetti dinner. The dog lay down on the bunk, relaxing as my sister began cleaning her dishes. Feeling a little hesitant about eating with the dog practically sitting on the table, I put the plate on the opposite side. Realizing I’d forgotten something, I got up and went to the stove. A matter of seconds later, I turned around and there he was, brave as ever, standing on the table, his face deeply immersed in my food. It made me wonder why she didn’t train him better. My American Eskimo and several other of my dogs were quite trustworthy. I’d become so confident in their obedience that one day I placed a plate with food on a low table and walked away. When I returned, the dog was well away from the food. He didn’t even care that it was at eye-level and an easy grab. I was so proud of him. This entry was posted in Problem Behaviors and tagged dog stealing. Bookmark the permalink. 3 Responses to Should you trust this face? My little Frenchie was so good he wouldn’t even touch a plate on the floor unless he got the nod. Wasn’t trained, that’s just the way he was. Now, our dachshunds, they were another story. This is a common problem I had with my American Eskimo. It was probably because of his first owners who gave him the run of the house because they were afraid of him. With some persistence, I finally taught him not to steal from the counter, but he never could be trusted with a coffee table temptation.